"Get More Traffic, Subscribers And Customers, By Offering A Valuable Automated Service On Your Website"
Like everyone who own a website, you're almost certainly looking to get more traffic, more subscribers and more customers. So I'm sure you'll be very interested in our new Backlink Seeker software. With Backlink Seeker, you can boost your own business, while helping other webmasters to build their businesses. 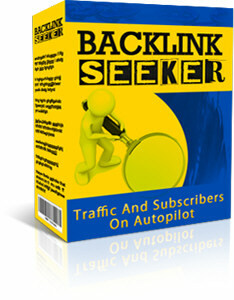 Backlink Seeker is fully automated - and does not require any ongoing effort from you. All you need to do is upload the Backlink Seeker script to your website. By setting up a Backlink Seeker system on your website, you can provide a valuable service to other webmasters who want more search engine traffic to their own websites. The service will help these webmasters find blogs that accept blog comments (which include a backlink). Webmasters can use your service to find suitable blogs and then post a comment to each blog (with an associated backlink). With just a few minutes work a day, webmasters can boost their search engine rankings to a higher level - and then keep them there. And because this activity is usually done on a daily basis, webmasters will return to your Backlink Seeker system (and your website) every day, to find more blogs to post to. Which means regular, daily exposure to any ads on your website. To try Backlink Seeker for yourself, click here (opens in a new browser window). I'm sure you'll agree that Backlink Seeker offers a very valuable service. But how does it help you to get more visitors, subscribers or customers? OPTION 1: Just offer free unlimited access to all visitors, to attract traffic. OPTION 2: Ask people to subscribe to your mailing list, before giving them the web address of the service. OPTION 3: (probably the most powerful option) Offer free access to all visitors, but when a visitor has used the service a specific number of times (specified by you), the visitor is asked to subscribe to your mailing list before they can continue using the service. OPTION 4: Offer use of the service only to your customers (or members of your membership site) as a valuable bonus. The choice is yours, depending on which option best suits your business. Backlink Seeker is fully template based. There are two pages shown to users - the first page where users enter their keywords and the second page where the results are shown. Both these pages are ordinary HTML pages that you can customize with any HTML editor. This means you can make the pages look like the rest of your website. And it also means you can include any ads you want on your pages, so they will be seen every time anyone uses the service. And there are no references to use or to Backlink Seeker on your pages, so it will look entirely like your own special service. The software is licensed for use on an unlimited number of websites, so you can use it on every site you own, if you wish, without paying any extra. I hope you can see the HUGE potential of using Backlink Seeker in your business. It is quick and easy to set up - and offers a powerful service that can help attract visitors, subscribers and customers to your business. With all these benefits, you might expect to pay a lot for this software. However, if you order right now, you can get your own copy for just $47. Script Requirements: Websites must support PHP (this is supported as standard on almost all web hosts). The tool that creates the script requires a PC running Microsoft Windows (any version). Earnings Disclaimer: Although we provide a powerful solution which can help attract visitor, subscribers or customers, the results are dependent on many factors outside our control. We are not therefore able to give any guarantees about the number of visitors, subscribers or customers, or the level of income that you will attain by using this software. We will however happily refund your money in full in the unlikely event that you are unhappy with your purchase.